Nantucket calls to mind images of stunning New England shoreline, beautiful Cape Cod homes, and the quintessential coastal lifestyle. 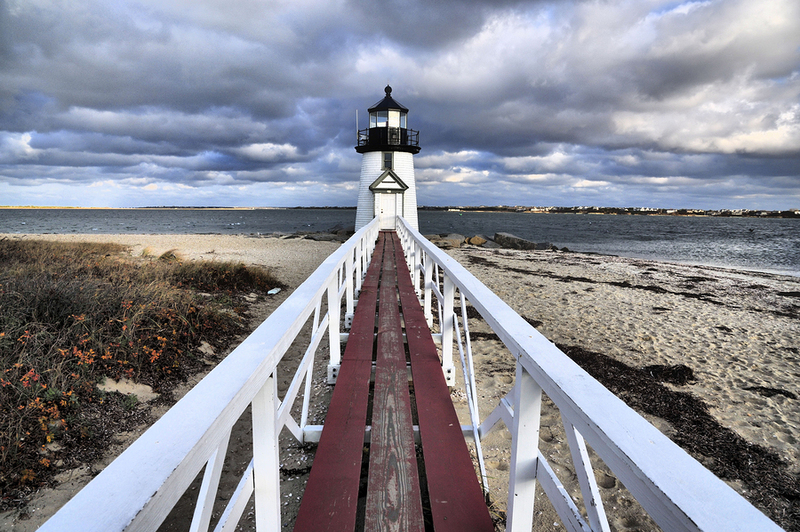 Nantucket is an interesting mix of natural beauty and a trendy social scene. Inside the town you’ll certainly find plenty of high-end eateries and shops, but you can also easily enjoy the natural beauty and serenity of the area as well. If you’re planning a Nantucket trip the peak season is during the summer months, but it also becomes expensive during this time. If you go during spring or fall, you’re going to enjoy a less expensive trip and also miss some of the crowds, although it might be a bit chilly. Travel + Leisure names four things that are not to miss in Nantucket—visiting Great Point via Jeep or fishing boat, shopping the preppy shops on the island, a sunset dining experience on Madaket Beach and taking in the views from Altar Rock. A visit to Cisco Brewers/Nantucket Vineyard. If you want to take in the local alcohol production scene and enjoy some samples, definitely visit these facilities. If you want to look as if you fit right in with the locals hop on over to Murray’s Toggery Shop for some of the traditional preppy gear that’s been a fashion mainstay on Nantucket since the 1940s. Take a trip over to Young’s Bicycle shop and rent a bike, often named as one of the best ways to tour the island and get a feel for all it has to offer. If you want an authentic beach experience, opt for the Cliffside Beach Club. Rather than being “close” to the beach, it’s right on it. It first opened as a private club in the early 1900s and its located just to the west of Jetties Beach. This isn’t necessarily a chic or high-fashion hotel in terms of the décor, but you’re going to experience the surf and the salty air in all its glory. There’s also a massive gym and lap pool on the property if you’re into working out on vacation. If you want something that’s both historic and stylish, consider the Union Street Inn. The Union Street Inn is a historic house built in 1770 and the rooms are beautifully decorated. You’ll get a complimentary breakfast each morning as well. One of the must-visit shopping venues on Nantucket is the Nantucket Farmers & Artisans Market. It takes up two blocks of Cambridge Street and you’ll find loads of island farmer and artisan vendors. You can find beautiful and one-of-a-kind handmade goods or hop on over to pick up a mid-day snack like a freshly baked fruit tart. While there are certainly some high-end eateries on the island, if you want something more casual visit Millie’s Restaurant. Millie’s serves Baja-style fare and ultra-fresh seafood. The fish tacos are a signature item at this laid-back eatery.